You're not going to find 2014 Topps Chrome Update Series Baseball in traditional boxes. Even single packs might be a little tough to come by. Like last year, the set is only available as part of a special retail Holiday Mega Boxes that also come with packs of 2014 Topps Update Series Baseball. The 2014 Topps Chrome Update Series base set has 55 cards. The checklist focuses heavily on rookie players but also includes a handful of veterans. Update cards are easily discernible from regular 2014 Topps Chrome cards thanks the the "MB-" prefix on the number on the back. Base cards have both Gold Refractor (#/250) and Black Refractor (#/99) parallels. 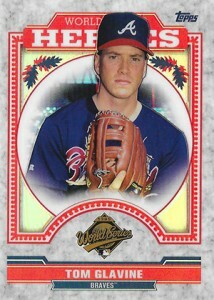 World Series Heroes is the product's lone basic insert. With 20 cards, it's a shrunken-down version of a similar insert from Topps Update Series that highlights memorable performances from the Fall Classic. All-Star Stitches Chrome Relics represent the majority of the hits in 2014 Topps Chrome Update Series Baseball. Ten players also have autographed versions. Each of the Holiday Mega Boxes has two packs of 2014 Topps Chrome Update Series as well as five regular retail Update Series packs. Jose Ramirez 2014 Topps Update Chrome Xfractor Rookie Card #45. 2014 Topps Chrome Update #MB19 Jacob deGrom RC!! HOT! SP Retail Only!! 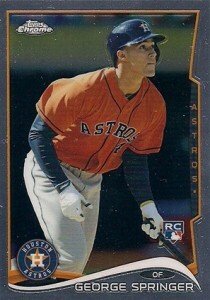 2014 TOPPS CHROME UPDATE GEORGE SPRINGER RC BLACK REFRACTOR ASTROS #70 99 RARE! 2014 Topps Chrome Update # US-301 Mookie Betts MINT ROOKIE CARD!!! 55 cards. Several players have two different cards. I gave this a shot and I pulled an All-Star Stitch Cano. I think I might be one of the last set builders around. There has to be another way to get packs of these cards! I have had fun with this set, but the pack loading was way off. I have pulled 5+ of multiple cards, but am still missing about 37% of the set. Not too bummed about having multiple of DeGroms though! Just pulled my first All-Star Stitches Chrome Relic – the Andrew McCutchen card – out of a 2014 Chrome Update pack! This is the most excited I have been about collecting baseball cards since I was a teenager in the early 1990’s! All the Mookie Betts I have seen is US-20 instead of MB-20. Is this an SP or did they make a mistake when printing? Curtis � Looks to just be a printing error. What is the deal with Mookie Betts minor league pitching? Error card…value? I know I’m late to the party but wow. purchased a case of this recently. just broke only the chrome and hit a black refractor abreu rc, a gold springer and a gold betts! there was also an all star relic and another couple of refractors. the same cards did show up time and time again and in close to the same order in the packs. there was only one of each betts base chrome and a couple of springers as other players probably had 4 or more come up out of 32 packs. at this point the paper update packs are just gravy.